Barbara and I have just spent 3 days walking in Dartmoor, only 90 minutes drive from Falmouth, in the adjacent county of Devon, the only English county to lend its name to a geological epoch. The Devonian and Carboniferous geology of Devon is complex and fascinating, and Dartmoor and Cornwall's Bodmin Moor are the roots of the Variscan mountain range, formed about 300 million years ago when the ancient continents came together to form the supercontinent Pangea. The heat generated by the colossal tectonic forces partially melted the mantle, which crystallised into a gigantic (Cornubian) batholith, which underlies much of Devon and Cornwall, and outcrops on Dartmoor to form the fantastically eroded tors. Anyone travelling to Cornwall should try to take time out to visit Dartmoor. The main arterial road, the A30, skirts the northern boundary of the Dartmoor National Park, a vast wilderness of deep gorges, dense woodland and high barren moorland. It is an area of outstanding natural beauty and romance, the setting for Conan Doyle's Hound of the Baskervilles, and home to the famous Napoleonic prison. This wild and often inhospitable terrain is one of the reasons for Cornwall having retained its Celtic roots. The moor, and Cornwall's equally hostile Bodmin Moor, served as natural defensive barriers, deterring the Romans, Normans and Saxons penetrating this extreme south-west area of England. The COM 2009 Nickel, Cobalt conference ends tomorrow in Sudbury, Ontario. A special session at the conference honoured Jim Finch, of McGill University, and Norman Lotter of Xstrata reports that Jim’s special session saw some really good fundamental flotation papers, including one from Prof Roe-Huan Yoon on collectors. Janusz Laskowski did a fine job on potash flotation. What was very nice was that many of the presenters are ex-students or old classmates of Jim (Norman learnt that Roe-Huan Yoon studied alongside Jim in their respective MSc programmes at McGill 1968-1969). Jitendra Mihsra, of Bateman, India, today became the 200th member of the Minerals Engineers group at LinkedIn. I joined LinkedIn only 3 months ago, and set up the Minerals Engineers group, and it has proved to be a great way of keeping in touch, and of discovering lost contacts. Networking is essential in developing business links, and professional networking sites such as LinkedIn are invaluable, but there is no substitute for face to face contact, and this is where attendance at conferences and other meetings is all important. MEI aims to be represented at as many major conferences around the world as possible, and very few visits prove ineffective in developing new contacts and ideas. A glance at the left hand column of the MEI Online home page and the Calendar of Events shows that we are involved in some capacity with many upcoming conferences, so if you are organising a meeting give us a call and I am sure that we can arrange a mutually beneficial, non financial, deal. It may just be as simple as a display of logos on respective websites. Ashes back where they belong! I've been a bit of a couch-potato this weekend, watching England beat Australia in the final test at the Oval, to regain the Ashes. It's not often that we can celebrate an England series win, but it is all the sweeter when it is against the old enemy. There will be a large Aussie contingent at Flotation '09 in November and all the MEI team have been briefed "whatever you do, don't mention the cricket." Is the Climate Debate Over? I refer to your Introduction to Climate Change in the Minerals Industry ’11. Time magazine may have said that the debate is over, but judging by the comments that I receive from many scientists, and discussions on climate change groups on LinkedIn, the debate is very much still on.We are living in an experiment at the moment, the results of which may not be known for decades. Many people argue that climate change is totally due to man, others (including many geologists) that it is nothing to do with man, and is associated with natural cycles etc. My view is that the answer probably lies somewhere between these two extremes, and it would be naive to think that man has no part in climate change. There have been many interesting peer-reviewed papers on the subject recently, a typical one being that of Lillo and Oyarzun in Science & the Total Environment (Vol. 407 Number 11, 2009). It may well be that climate change is totally down to the follies of man, but no one really knows for sure, and scientists have been very wrong before in their predictions - 40 years ago we were about to enter a new Ice Age.What we are trying to say in the conference Introduction is that even if we feel that there is only the tiniest of chances that it is solely man-induced, then we should pull out all the stops to limit CO2 emissions. If we are wrong and we do nothing, then the effects may be too dire to contemplate. The thrust of the conference will therefore be on how we reduce emissions in the minerals industry and what might be the economic impact of this. Maybe this doesn't come over clearly in the Intro? Correctly, the thrust of your conference has to be on how to reduce emissions - but radically, by 60-90%, not relative improvements in eco-efficiency of 5% here or 10% there. But your introduction still makes it sound like "we'll do our part even though this might not be necessary". This reinforces perceptions of an obstructionist agenda, and this has big implication on how potential young professionals consider applying for employment in this industry. By citing the article by Lillo and Oryazun in justifying your stance, you display a misunderstanding of the scientific process. Theirs is a scientific commentary (not a research paper! ), in a reasonably respected journal, by two authors who are not particularly well known from some backwater Spanish institution. They might be making some valid points - but weigh that relative to the consensus building peer process of the 1st, 2nd, 3rd and 4th IPCC assessments!....and in their concluding statement, these authors say that they do not prove or disprove anything with their commentary. So you are wrong to cite it to say that the current theory of human-induced climate change might not hold. They merely point out the complexity of the system, something that all climate scientists acknowledge. Calling for "proofs" is asking for the "experiment" to conclude. That is the Bush - Oil Industry agenda. The proof is in the models - whether it was Svante Arrhenius' hand-solved calculation model 100 years ago or the latest mega-computing efforts. We are basically saying the same thing- that we should be doing all we can to counter carbon emissions. Our differences lie in the way that we look at it. You obviously feel that the climate models are infallible and that emissions are totally the results of human activity. My feeling, having had experience of relatively simple mineral processing models, is that there may be other factors which have as yet not been incorporated in these models- but I may be wrong, no one really knows. Interestingly, the Australian senate has just defeated that country's version of cap and trade. According to the BBC report, opposition senators who control the upper house feared the legislation would harm the country's mining sector. This decision was no doubt influenced by a new book by Prof. Ian Plimer, a geologist at the University of Adelaide. Heaven and Earth: Global Warming, the Missing Science, totally refutes the claims of human-caused global warming. So I don't believe the debate is over. It will be interesting to see what the state of play is when the conference runs in Falmouth in two years time. Thank you Barry for responding. I can't see how you think we're saying the same thing if you keep mentioning that the science is being "totally refuted". What you cited as evidence yesterday seems to have been weak - at least you haven't answered my critique - do I need to spend another hour or two trying to check on the story you're putting up today? Does a book by a geologist count as peer reviewed science and how does it weigh up with the IPCC's 4 assessment reports? Yes, the public debate and the politics on this is a mess - but I think you owe it to your constituency to represent the science correctly on your website. And no, I'm not saying that I believe the models are infallible - I am just saying that it is in the nature of this case that if you wait for the proof, it will be too late. So I can't see how you can ignore the models. We're not talking about simple mineral processing models, but very complex ones that capture a lot of the known non-linearity already. Thanks for a good debate. We are saying the same thing regarding the need to reduce emissions. Some people refute the science (notably Ian Plimer) who is a reputable geologist. OK, his book is not peer-reviewed, but the paper by Lillo and Oryazun was, but you discount this because the authors are from a 'backwater Spanish institution'. Regarding modelling, I was stating that even simple processes such as mineral processing operations are difficult to model, so the complexities of the climate pose even more problems. And yes, I agree with you that if we wait for the proof it may be too late. Exactly my point that we should be pulling all the stops to reduce emissions now, rather than wait until the results of the experiment are finally known. Playing squash again after my recent eye injury. Got my revenge on Jon. Beat him without having to resort to his underhand tactics of two weeks ago! Just had an email out of the blue from Les Stewart, who I have not seen or heard from in 36 years. I worked with him for a few months on the Nchanga high grade leach plant in 1973, and also remember him as a fine squash player. Les retired to Alderney in the Channel Islands about 6 yrs ago after a spell in Perth. He now has a one man consulting business in which most of the work has been for Inco, now Vale, in nickel laterites - in Brazil and Goro, New Cal. He is now doing some gold work. I look forward to more blasts from the past. My old friend Dr. Terry Veasey, and his wife Pauline, have been staying with us over the past few days. Terry left the minerals engineering group at Birmingham University in 2004, and is now an eminent consultant to the Greyhound Board of Great Britain, advising on track surfaces, and writing articles for the Greyhound Star. He was UNESCO Professor of Chemical Engineering at the National University of Science & Technology, Bulawayo, Zimbabwe from 1995-1997 and in the early 1990s was a familiar face at the early Minerals Engineering conferences. 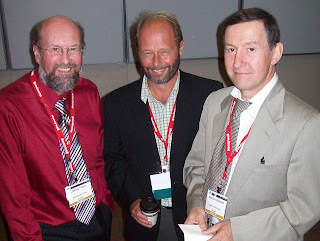 The picture below was taken at Minerals Engineering '92 in Vancouver, and shows Terry and me with Byron Knelson of Knelson Concentrators. Terry would be interested in hearing from any of his past students- just contact me and I will supply his email address. Vineyard Hotel in Cape Town South Africa from November 11 to 12th, 2008. Met old friends and made new ones. Both myself and my wife, Liza, enjoyed our time there. When I returned home I wrote up a description of the conference on our Departmental website with some pictures. Looking forward to attending future MEI conferences. We will shortly be starting a regular weekly(ish) feature where we hope we can post your notes and photos on conferences which were particularly memorable to you. Although intended to be light-hearted, this could also highlight what people look for in conferences and may help improve events. What was the first conference that you attended? I can think of a few eminent people who were initiated to the conference circuit at MEI Conferences. What are your views on the IMPCs? Next year the XXV International Mineral Processing Congress (IMPC) will be held in Brisbane, Australia, and promises to be a lavish affair. I would like to know what people think of the IMPC, and what are their most memorable experiences. I attended by first IMPC in Stockholm in 1988 and have missed only one since, Rome 2000, which by all accounts was the one to miss! In 2003 the Cape Town IMPC set new standards, in terms of the conference dinner and other social events, which were maintained at the IMPCs in Istanbul and Beijing. In my view the IMPCs are events not to be missed. All minerals engineers should strive to attend; these are the great meeting places for minerals engineers from every discipline, from process mineralogy to pyrometallurgy. The exhibition and the social events provide great opportunities for networking. Having said that, in my opinion many of the papers presented have been mediocre. In Istanbul (2006) 457 papers were presented, and in Beijing (2008) 690 were presented and published in a massive 4-volume proceedings, weighing in at nearly 12 kg- a total of around 10 tonnes of paper, most of which will probably never be looked at, as the organisers also provided a much more convenient CD! There is no way that high overall quality can be obtained from this number of papers, and from experience I know that it would be impossible to effectively peer-review this number and provide a high-calibre proceedings for distribution at the event. Barbara and I were in Penzance this morning, for the funeral of Maggie Clark, who sadly died in France only 6 weeks after being diagnosed with pancreatic cancer. 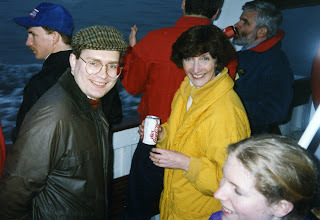 Maggie was a vibrant person, full of fun, and will be remembered by many who attended MEI Conferences in the 1990s. She was formerly PA to the Assistant Director of Camborne School of Mines, Keith Atkinson. In this photo, she is pictured with Richard Williams at Complex Ores '93 in Falmouth. 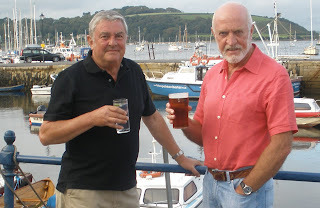 Jon and I lunching at the 3 Mackerel Restaurant in Falmouth with Nick Lamb (right) of RMRI, just after signing an agreement between MEI and RMRI to organise a conference Risk Management and Risk-Based Decision Making, which will be held in Falmouth, May 13-14, 2011. We have been planning this conference for the last three years, after a chance meeting with RMRI Chairman Alan Minty in Cape Town. I first met Alan in Zambia in 1969. 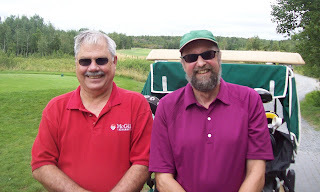 He was a mechanical engineer in one of the open pits, and a fine powerful squash player who introduced me to the sport. He became Copperbelt squash champion and later became an English County champion and international, whereas I reached only the dizzy heights of English minor county level. Alan and I, keen observers of Zambian life, had watched with interest the movement of the African population between the various Copperbelt towns. Few of the Africans owned cars, so they made full use of buses and taxis. Taxis were everywhere, rickety vehicles carrying inordinate numbers of passengers. There was money to be made here. All we needed was a good car and a reliable driver and we could then sit back and count each day’s takings. Alan had a driver in mind, one of his African workers, who was keen to leave the mine, so we put our meagre savings together and bought a fairly new Nissan station wagon which would more than adequately serve our needs. We planned everything meticulously, possible routes, fares and the commission for the driver, who, having great confidence in us, had given up his mine job. The great day dawned, we gave the driver his final briefing, he proudly took his seat in the taxi, drove away, and that was the last we ever saw of him or the car!! Thankfully we had not provided him with an expensive uniform as well. Alan and I lost touch after leaving Zambia, but met up again quite by chance over thirty years later in, of all places, Robben Island off Cape Town. Barbara and I had been visiting Cape Town for many years, and thought we should at last visit this small windswept island where Nelson Mandela had been incarcerated for 27 years. On leaving the boat we transferred to the coach, that would take us to the old prison, and there sitting opposite us were Alan and his wife Sheila, instantly recognisable after all those years. We had a great reunion dinner in Cape Town, where we reminisced and caught up on how our careers had developed since our Zambian days. It transpired that Alan had a thriving family business in the oil and gas industry, specialising in, wait for it, risk assessment! Oh, the irony of it! If only we had carried out some form of risk assessment 35 years previously our African driver would not have had his early Christmas present. Anyway, I look forward to telling this tale when introducing Alan at the Falmouth conference. This is Falmouth's busiest week of the year, crowded with tourists. Yesterday we were treated to a magnificent display by the Red Arrows, who performed their dazzling skills for 30 minutes over the harbour. 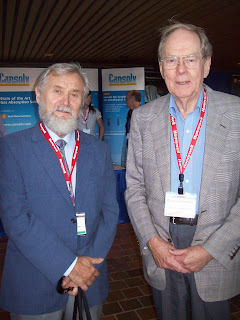 "My first visit to S. Africa was on the occasion of 75th Anniversary of the S. African Chemical Society. In November 1986 I received a telephone call from Dr. Michael Laing, Chairman of the Organizing Committee and Professor of Chemistry at the University of Natal, inviting me to present a Keynote Lecture at the conference. I accepted and went to Durban at Hotel Elengeni where the conference took place July 6-10, 1987 . At that time visitors to South Africa had the option to buy a “See South Africa” ticket at a reduced price if one extends his visit for two weeks which was an excellent opportunity for me and my wife to visit a number of cities. In Johannesburg I visited the University of Witwatersrand where I met Peter King in his office. My wife Nadia took the photo. 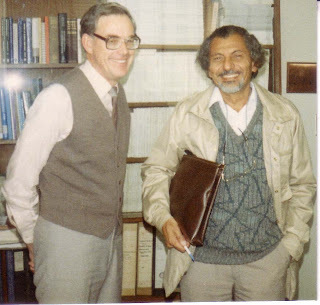 Incidentally, I met Peter King again during my visit to Salt Lake City in 1991 where I stopped at the University of Utah to give a seminar to students at the Department of Metallurgy. I was on my way to California to attend a conference on fine particles. I came across the photo because I am preparing a paper entitled, "Travelling in South Africa" to be presented at the International Session of SME Annual Meeting that will take place in February 2010 in Phoenix, Arizona." How do we argue the case for gold mining? The output of the world’s gold mines fell by 4% last year, according to estimates in a new report from the GFMS, a consultancy. More than half the 88-tonne fall in production was accounted for by a slump in gold mining in Indonesia. Supply from South Africa, once the world’s largest producer, fell by 14%—the biggest drop since the Boer War. Last year’s fall was partly owing to new safety procedures, which helped reduce the industry’s fatality rate. Skills shortages and power cuts also affected operations. Australia’s output fell by 14%, too, amid reports that some fledgling mining firms faced closure because of scarce credit. Of the world’s six big producers, China, Russia and Peru all increased output last year. The total amount produced last year was 2356 tonnes. As everything we use is either mined or grown, it is generally easy to argue the case for mining most commodities, but not so easy for gold. It has been estimated that 158,000 tonnes of gold has been mined over history, of which around 65% has been mined since 1950. Although gold is used in jewellery (about 70%), and has industrial uses, such as dentistry and electronics (around 11%), about 13% of annual production is used for investment, and around 20% of all the gold in circulation is held by central banks. Think about it- that is 13 years world production of gold at current mining rates. In a note entitled No more space for Gold Bars, Swiss news website 20 Minuten Online reports that Swiss banks are running out of secure storage space for gold bullion held by investors and institutions in their vaults. Fears of hyperinflation, the economic downturn and the success of gold index funds (ETFs), which are supported by physical gold, has led to a run on precious metals investment - and in gold in particular, and in the necessary secure storage space in which to hold it. One Swiss bank, earlier this year, reported that it was having to relocate some of its stored silver bullion to another site to make room for gold. The Zurich Kantonal bank put this down to the success of its gold ETF. The website reports another Swiss investment banker despairing "We have the need to store more gold for our clients but are finding it difficult to find secure storage facilities". Gold storage makes high demands on security which is what is making the gold holding task more difficult. Few banks will divulge exactly where their gold is stored for security reasons. Another banker reported that his bank still had space but that it is beginning to run out. When you consider that a 12.5 kilo gold bar occupies only about the same amount of space as a large carton of milk, we are talking lots of gold here! How do we justify to laymen the vast technological and human effort in mining gold from deep undergroung, refining it, casting into bars, and then storing them underground again? Hope to have comments. Resting at the moment! Spent the afternoon in casualty after taking a squash ball full in the eye while playing Jon. The nurse who was examining me said that I was lucky that I did not lose it. I had to explain that I did, as Jon claimed the match even though I was 8-3 up in the final game!! I have had a response to the posting of July 31st from Paul Mitchell of Green Horizons Environmental Consultants Ltd, UK. His full response can be found in the Minerals Engineers news discussions on LinkedIn. Craven's ingenious argument is that when it comes to global warming, the facts we fight over don't actually matter. Far more important is that the experiment is already running. We will see soon enough who is right, but in the meantime, Craven believes we should analyse the situation using the tools of risk management. Here, the answer is indisputable. If we take strong action and global warming turns out to be no big deal, we have needlessly incurred a serious economic cost. If we fail to take strong action and global warming turns out to be catastrophic, we have sacrificed the entire planet and everybody's future. Clearly, inaction carries the greater risk. Amid all the hysteria of whether or not global warming is taking place, whether it is man-made etc, etc, this seems to be a sensible, straightforward approach to the issue. Commodity markets have become too "frothy", which could lead to greater price volatility in the coming months, Mick Davis, the chief executive of Xstrata, has warned. Prices of traded metals such as copper have surged in recent weeks amid optimism that the worst of the recession is over. Copper prices have returned to levels last recorded in October 2008 and aluminium, zinc and nickel have also hit ten-month highs in the past week. “Prices have been moving up quite strongly and there is some froth in there,” Mr Davis said. “Sentiment has been driving prices rather than fundamentals so there is a high degree of volatility.” Mr Davis, the head of the world’s fourth-largest mining group, added that the general growth trend was still positive and being driven by renewed demand from China. I have just received this history of the Balkan Mineral Processing Congresses from Fathi Habashi. The organization of Balkan mineral processing engineers took place in Athens on September 30, 1971 when representatives from Bulgaria, Cyprus, Greece, Romania, Turkey, and Yugoslavia met and signed a protocol forming the International Association of Engineers of South-East European Countries. This seems to have been at the initiative of Professor Kiriak Kovachev, Rector of the University of Mining and Geology in Sofia and President of the Bulgarian Association of Mining, Geological, and Metallurgical Engineers. The first task of the Association was to organize conferences where engineers and academics from the Balkan countries could meet to present and discuss recent work on mineral processing. 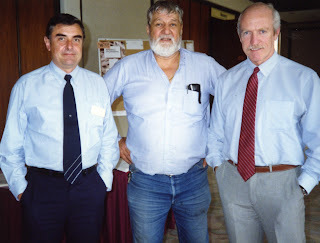 The First Balkan conference was convened in Varna and at the last session, the Balkan Scientific Committee for Mineral Processing Conferences was founded with Prof. Kovachev as President, Prof. George Tsailas [Greece], engineer Stanka Patraš [Romania], Prof. Zeki Dogan [Turkey], and Prof. Dušan Salatic [Yugoslavia] as members with the task to convene future conferences at three years intervals. In 2000 the name changed from Balkan Mineral Processing Conference to Balkan Mineral Processing Congress. From the beginning there was a language problem. At the first and second conferences Bulgarian papers were published in Bulgarian and Russian, Romanian papers in Romanian and French, Yugoslavian papers in English and French, and Turkish papers in English. At the third conference this problem was partially solved by having simultaneous translation of papers presented in the four official languages of the conference: English, French, Russian, and Serbian. It was only at the sixth conference that it was agreed to have English as the only official language. The third conference was originally scheduled on April 22-26, 1980 but had to be postponed to June because of the death of President Tito. This resulted in the cancellation of participation of many authors. At the fifth conference the number of participants declined greatly evidently because of the tense political situation in Eastern Europe which resulted in the collapse of the Soviet Union and the dismembering of Yugoslavia. Cyprus became divided between the Turks and the Greeks. Invitations to Croatian and Slovenian engineers were turned down considering themselves not Balkan although they were originally members of the former Yugoslavia. As a result, the sixth conference took place six years after the fifth. Thanks to the initiative of Professor Güven Onal at the Istanbul Technical University who called for a meeting in Istanbul in January 1995 to discuss the issues. Decisions taken at the meeting included the use of English as an official language and extending invitations to mineral processing communities outside the Balkan countries. The year 1995 was therefore a turning point in the history of the Association. It was at the seventh conference that participants from Australia, Czech Republic, China, Germany, and Italy took part for the first time. Due to the widespread destruction of the infrastructure in Yugoslavia during the 78 days NATO bombardment the eighth conference planned to be held in Heceg Novi on the Adriatic was to be moved to Belgrade. Also, because of the international sanctions implemented towards air traffic carried in and out of Yugoslavia as well as the negative attitudes from some countries towards Yugoslavia a large number of foreign authors were unable to attend. As a result only 60 papers were presented but 144 were printed in the proceedings volume. At the eighth conference, at the initiative of Professor Güven Onal the Balkan Academy of Sciences on Mineral Technologies was created. The help of Professor Güven Onal, Technical University of Istanbul for supplying certain information is gratefully acknowledged. Fathi Habashi is a remarkable man. He must have published more mineral processing books than Agatha Christie has murder novels, and has probably written 90% of the book and proceedings reviews that appear in MEI Online. 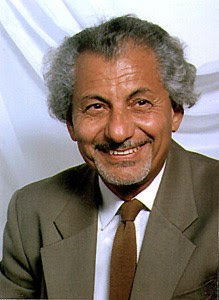 Fathi is Emeritus Professor of Extractive Metallurgy at Laval University, Canada and I have just read an interview that he conducted for a Turkish website. It's worth a look. Today's Times magazine takes a light-hearted look at high-value objects, calculated in price per kg. Those "chunks of coal made under pressure", as Henry Kissinger called diamonds, are without peer- even when considering an average one, retailing at around £6,890 per carat. On this scale, diamonds rate at £34,450,000 per kg!! Raphael's The Madonna of the Pinks came close at £27,500,000/kg, probably suffering by virtue of being painted on a yew panel, weighing 800g. Gold came in at £18,476/kg, an Airbus A380 at £649/kg and a Trident Nuclear Missile at £287/kg. It's obviously that time of year when people are looking for things to occupy their minds. Unfortunately enjoying the "great British summer" has not been an option!